The combined capital city preliminary clearance rate increased to 74.8 per cent this week, up from a revised final clearance rate of 69.4 per cent last week, while auction volumes increased week-on-week. There were 1,712 properties taken to auction this week, up from 1,627 last week, and higher than this time last year, when 1,329 auctions were held and a clearance rate of 67.9 per cent was recorded. Based on the preliminary collection, all but one of the capital cities saw the clearance rate increase week-on-week. Melbourne’s auction market has continued to show some resilience to softer auction conditions, recording the highest preliminary clearance rate at 79.4 per cent, although this is likely to revise lower when the final auction results are released on the following Thursday. While Melbourne’s clearance rate has remained comfortably above 70 per cent since July last year, final auction results show Sydney’s auction clearance rate has been tracking below 70 per cent over the past six weeks, so it will be interesting to see if the preliminary clearance of 74.9 per cent is again revised below the 70 per cent mark. Across Melbourne, preliminary results show that 79.4 per cent of the 676 reported auctions sold this week. There were 816 properties taken to auction across the city, up from 756 last week when the final clearance rate was recorded at 74.9 per cent. Over the same week last year, 572 auctions were held and a clearance rate of 71.6 per cent was recorded. The West region of Melbourne had the highest number of auctions this week (168), with a preliminary clearance rate of 76.4 per cent. However, the strongest rate of clearance was recorded across the North West region, where 90.1 per cent of the 71 reported auctions were successful. 5 of the 9 sub-regions recorded clearance rates above 80.0 per cent. Sydney was host to 613 auctions this week and a preliminary clearance rate of 74.9 per cent was recorded, rising from 69.2 per cent last week across 609 auctions. 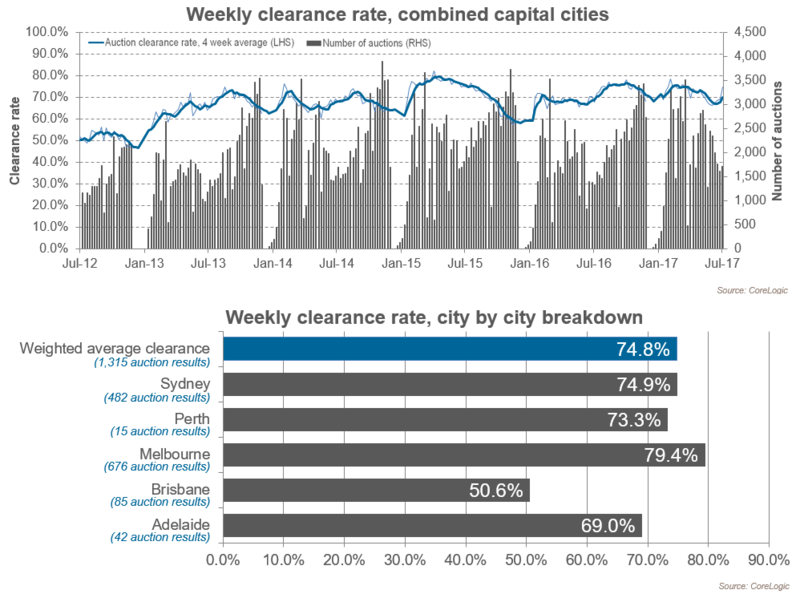 The final clearance rate for Sydney has been trending below 70 per cent for the last 6 weeks, although it has been nudging higher over the last two weeks. One year ago, 473 auctions were held across Sydney and 71.5 per cent were successful. Looking at the sub-regions of Sydney, 7 of the 15 sub-regions recorded clearance rates above 75.0 per cent with the stand outs being the Northern Beaches (92.3 per cent), Eastern Suburbs (89.2 per cent), North Sydney and Hornsby (83.6 per cent) and City and Inner South (78.3 per cent) regions. The preliminary clearance rate in Brisbane this week rose to 50.6 per cent, from 41.7 per cent last week. Auction volumes were slightly higher this week with 126 auctions held, up from 116 last week. Meanwhile, across the Gold Coast, 41.4 per cent of the 29 reported auctions were successful. In Adelaide, a 69.0 per cent preliminary result was recorded this week across 73 auctions. Last week, 64 Adelaide auctions returned a clearance rate of 69.0 per cent for the city, while at the same time last year, 68 homes were taken to auction, with 56.3 per cent recording a successful result. Perth’s clearance rate of 73.3 per cent across 15 auction results is up from last week, when 35 auctions were held and a clearance rate of 46.2 per cent was recorded. Over the same week last year, the clearance rate was a lower 33.3 per cent, and 22 auctions were held. Across Canberra, 46 homes were taken to auction this week. Preliminary results show a clearance rate of 73.3 per cent, up from 68.9 per cent the previous week. Tasmania was host to 3 auctions this week and so far no results have been reported.